The government on Tuesday honoured 178 businesspersons with Commercially Important Person (CIP) cards for their outstanding contributions to the economy of the country in 2016. Of them, 137 received the cards in the export category while 41 cards were awarded to the directors of the Federation of Bangladesh Chambers of Commerce and Industry (FBCCI) in the trade category as ex-officio members. 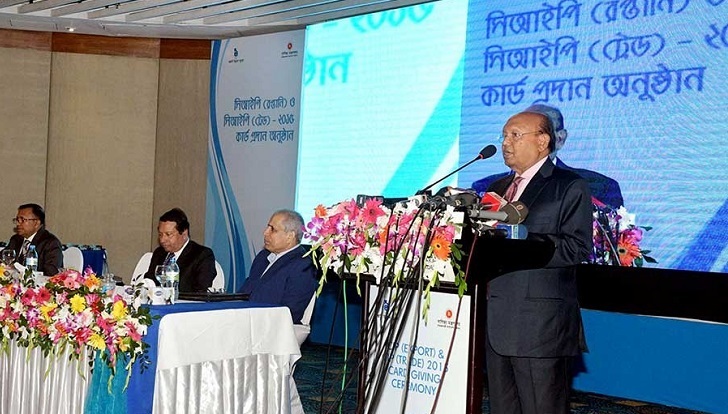 Commerce Minister Tofail Ahmed handed over the CIP cards to the businesspersons for their respective companies at a ceremony held at the TCB Conference Hall in the city on Tuesday. While speaking as the chief guest, Tofail Ahmed said Bangladesh has flourished economically for outstanding contribution from the private sectors. "We started export with US$ 348 million just after the Liberation War. Now, the export earning rose to $36.67billion," he said. The senior minister also said, "We are distributing the CIP cards to the business people who are playing important role for flourishing country's economy. Bangabandhu Sheikh Mujibur Rahman wanted to build strong economy of the country... However, his daughter Sheikh Hasina succeeded the dream." The country will achieve development status by 2041, he added. FBCCI President Shafiul Isllam said, "Bangladesh's economy means private sector's economy. We are at 176th position in ease of doing business in the world. Although we have to face various problems in the private sectors, we are going forwards as well. "The government took many mega projects. We request to the government to serve quality electricity and gas supplies in those projects, especially in Economic Zones" he also said. Ministry of Commerce in collaboration with the Export Promotion Bureau (EPB) jointly organised the programme to recognise the business community's contribution to the country. The CIPs will be able to use VIP lounge at all the airports in the country, receive visa assistance from embassies as well as their family members will also be given priority in booking cabins at public hospitals. They will also get passes to enter Bangladesh Secretariat without hindrance, participate in different national programmes and will be given priority in booking tickets for air, railway, and waterways on business trips.